The Central Pneumatic line of air compressors, pneumatic tools, and accessories was first introduced in 1982 by Harbor Freight Tools to meet a growing demand for quality, yet affordable, products for automotive, machinist, and shop use. Other popular Central Pneumatic tools sold include: impact wrenches, grinders, ratchets, and sanders. A basic set of tools should be something every homeowner should have on hand for maintenance, various projects, and even emergencies. 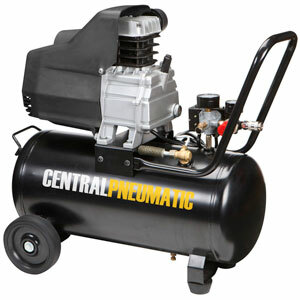 An air compressor is considered by many to be the most versatile tool to own. Whether you need to top off the air in your car’s tires, blow up the new inflatable swimming pool you bought for your kids, blow dust off the top of your workbench, or finally put up that new fence, owning an air compressor will save you both time and money. There are literally hundreds of uses for air compressors around the house. 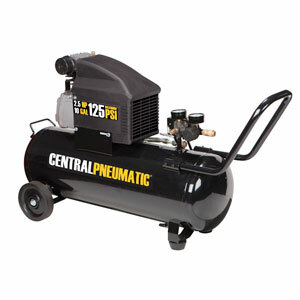 With a Central Pneumatic air compressor, you don’t have to spend a lot for this important piece of equipment. Who Makes Central Pneumatic Air Compressors? 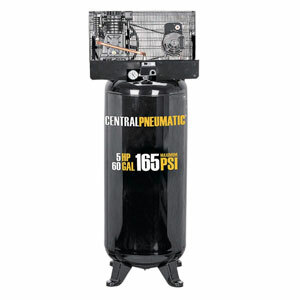 What Size Central Pneumatic Compressor Should I Get? 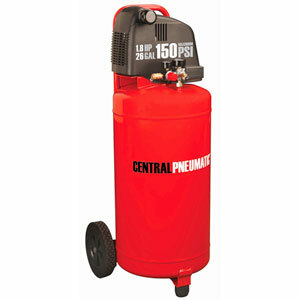 Central Pneumatic is a brand of air compressor and air tools sold by Harbor Freight Tools. The compressors are made in Taiwan and are a popular economical option for homeowners and DIYers. While tool companies such as Makita, DeWalt, Ingersall Rand, and Rolair all build good air compressors for the most part, their price is out of reach for the common homeowner who realistically will make use of the compressor a few times a year. When you compare product specs of similar sized compressors, you will find that Central Pneumatic is a lot of times almost identical to brands which cost 3 or 4 times as much. While the premium brands may use slightly higher quality materials in some areas, parts in all compressors will eventually fail, especially without proper maintenance. 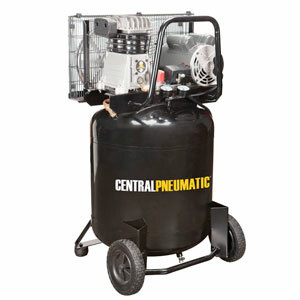 The decision to spend time and money on repairs versus buying a new compressor is made much easier when purchasing a Central Pneumatic air compressor. That said, you can easily find Central Pneumatic replacement parts at any Harbor Freight store or other retailers such as Amazon. That is NOT to say that Central Pneumatic compressors are junk. The company makes use of a state-of-the-art testing facility that simulates real-world environments. Testing is done pre-production, during production, as well as after for research and improvement of upcoming models. A 90-day warranty is offered on all Central Pneumatic tools. They can simply be returned to the nearest Harbor Freight store with a store receipt. Kobalt, Husky, and Campbell Hausfeld are three brands that Central Pneumatic compressors are most often compared to. Available at Home Depot, Lowes, or Ace Hardware, these brands often have comparable specs to Central Pneumatic and are in the same general price point. If you read reviews online for these competitors, you will notice they all have one thing in common… low ratings. Alternatively, if you go to Harbor Freight’s website and look at customer reviews on compressors, you’ll notice higher customer satisfaction. In addition, you may be able to easily find up to a 20% off Harbor Freight coupon that can be used towards the purchase of a Central Pneumatic compressor. Good luck finding a coupon for one of the big box home improvement stores. While Central Pneumatic tools are already priced quite low, it’s possible to get even a better deal. Harbor Freight’s slogan, “Quality Tools at Ridiculously Low Prices”, promotes its products through all types of advertising including: direct mail, newspaper, magazine, email, as well as their own website. If you’re on their mailing list, you will be mailed a monthly catalog showing their specials that month as well as a coupons you can cut out. 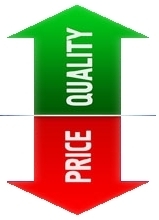 Alternatively, you will at times find a 10% or 20% off coupon on their website or coupon sites such as retailmenot.com. Coupons are generally good for only one item which makes them perfect for something like an air compressor. 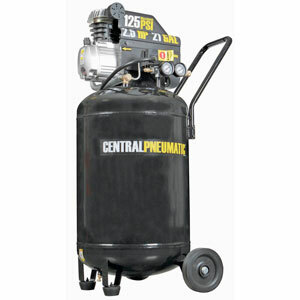 Central Pneumatic makes air compressors in a variety of tank sizes. While CFM (cubic feet per minute) measures the amount of airflow that a compressor produces, tank capacity determines how long that airflow can be sustained. When it comes to determining what size the storage tank on your compressor should be, your main consideration should be the type of work you’ll be using it for. 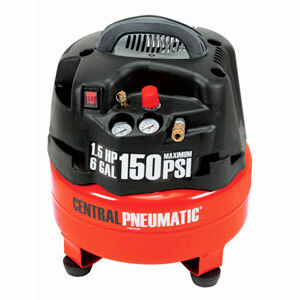 Here is a rundown of the different sizes of Central Pneumatic air compressors. One of the most common sizes for most brands of air compressors is the 3 gallon. This is your basic entry-level, low budget compressor which many get as their first compressor or if they will rarely be using it. Available in both pancake and hot dog shape (both delivering only 0.6 CFM at 90 PSI) these 3-gallon models are good for a number of light duty jobs. This excellent 4-gallon twin tank compressor (model 62763) is quite a bit more powerful (3.5 CFM at 90 PSI) than the 3-gallon. It’s designed for rooftop stability and works great with framing nailers and even some ratchets. The 4-gallon model is surprisingly strong enough to run two nail guns at the same time. The 6-gallon pancake compressor is simply a bigger and stronger version of the 3-gallon. With an output of 2.5 CFM at 90 PSI, it’s not as strong as the 4-gallon but its capacity will allow it to run longer without having to refill. So if you need to inflate a large truck or SUV tire, this is where the larger size proves to be an advantage. 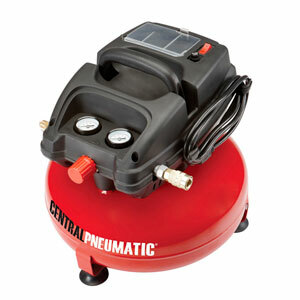 Central Pneumatic’s 8-gallon compressors (models 68740 and 69667) are two of the most popular items it sells. Producing 4.5 CFM at 90 PSI gives you the ability to run a wider range of air tools. While it’s not oil-less so minor maintenance is needed, it’s one of the best bang for your buck compressors out there. Next up is a 10-gallon (model 62441) which is both slightly larger and more powerful (5.3 CFM at 90 PSI) than the model above. The extra 2 gallons makes a big difference when you need continuous airflow such as when you’re using a die grinder or impact wrench. 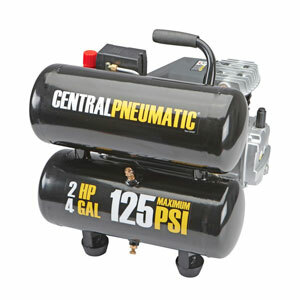 One of the best air compressors for a home garage, the 21-gallon (model 61454, 62803, 69091) is a popular seller. While slightly less CFM (4.7 at 90 PSI) than the 10-gallon, the large tank allows you to use air tools that are still off limits in the smaller sizes. While obviously less portable than a small compressor, it makes for a good garage centerpiece. Here’s a compressor that has a couple things going for it versus the 21-gallon. Obviously, the larger tank will allow constant airflow for a longer period of time. Also is the fact that this model is oil-less so there’s little to no maintenance required. That said, with a lower CFM (4.0 at 90 PSI) and higher price tag, it doesn’t make sense to go with this model in most cases. Recommended usage is the same as the model above. Now we’re back on track with the 29-gallon cast iron model (#61489). Along with the large tank you’ll get 5.9 CFM at 90 PSI making this an excellent choice for home auto mechanics or restorers. It will handle most any air tool with the exception of some large sanders and impact wrenches. This behemoth is the largest and most powerful air compressor Central Pneumatic sells (model 93274). Because it uses a 2-stage system, it can pump out 15.8 CFM at 90 PSI. This combination allows it to work flawlessly with any paint spray gun. It’s perfect for industrial, automotive, and commercial settings (or if you have a really large garage). The basis of all air compressors is the same. They operate by utilizing a pump to move and collect air into a tank while pressurizing it at the same time. 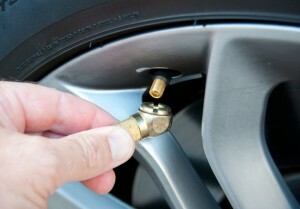 This air pressure is what powers the pneumatic tools that are attached to the end of a compressor hose. All tools require a certain amount of CFM (Cubic Feet Per Minute) to operate. While something such as a brad nailer may only need 0.5 CFM, a heavy duty impact wrench may need upwards of 10 CFM. In addition to the air output, tank size plays an important factor. An air compressor with a 1 gallon tank will empty much quicker than a 15 gallon tank thus requiring the pump to constantly be cycling off and on while it’s refilling when air is being used. A larger tank will allow you to work longer without worrying if the air compressor can keep up with your needs. It’s important to consider performance vs. portability when deciding on what size of compressor you will buy. Horsepower and maximum PSI are common specifications used when discussing air compressors but are generally overrated. Many low hp compressors are actually more efficient than higher hp models. Also, the difference between a 120 max PSI and 150 max PSI compressor is not really important since most tools have a recommended pressure setting of under 100 PSI. Central Pneumatic air compressors have a full 90-day warranty from the date of purchase to ensure your product is free from any defects in workmanship and materials. Simply return the item to your nearest Harbor Freight store or call their customer service department at 800-444-3353 to obtain a Return Merchandise Authorization (RMA) number. Alternatively, “first time use” and troubleshooting instructions are found in every Central Pneumatic air compressor manual for simple issues.